Thanks to Safe Catch’s new seasoned elite tuna, only 5 minutes stand between you and a protein-packed lunch of cajun tuna lettuce wraps! This post is sponsored by Safe Catch. As always, all opinions are my own. Thank you for supporting Hungry by Nature and the brands that make it possible! Hello friends, happy Tuesday! Can we all just agree that fall is here (thank goodness!) and it is officially the most wonderful time of the year?! For most of my life, fall signified the start of the school year, the end of the lazy summer days, and the beginning of a new routine. P.S. I love a good routine. And even though I don’t have kids heading back to school, this fall is extra busy for me and for Pat. Between our real-life jobs, our side hustles (yes, we both have them), potentially moving into a new house, traveling, and starting a new secret project that I cannot wait to tell you about, we have been hella busy. So busy that I have not been meal prepping at all and my lunches have been lack luster (to put it nicely). BUT !! Safe Catch has been my saving grace. Partner with farmers who sustainably catch tuna. Test ever single fish for its mercury content (P.S. they are the ONLY company that tests every fish). 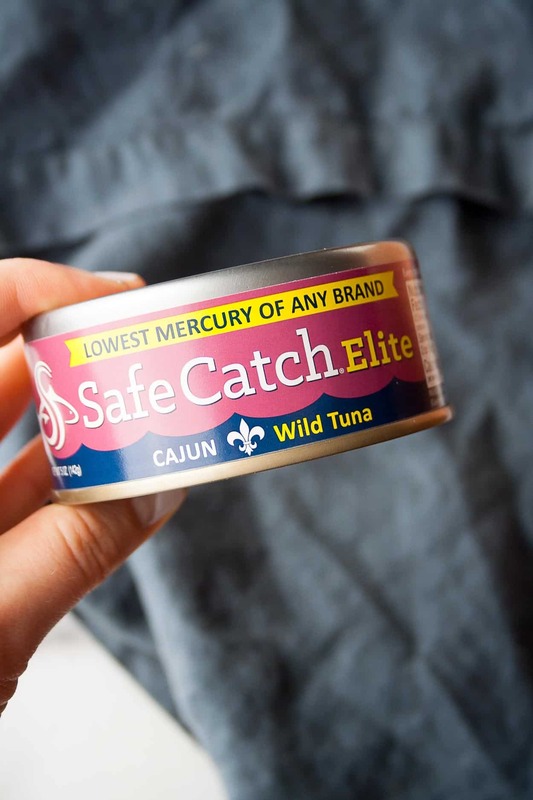 Hand pack tuna without any additives – leaving behind the naturally occurring fish oils and juices. Oh and the best part, they have created seasoned tuna that tastes freaking good and saves me time in the kitchen! You want in?? I thought so. 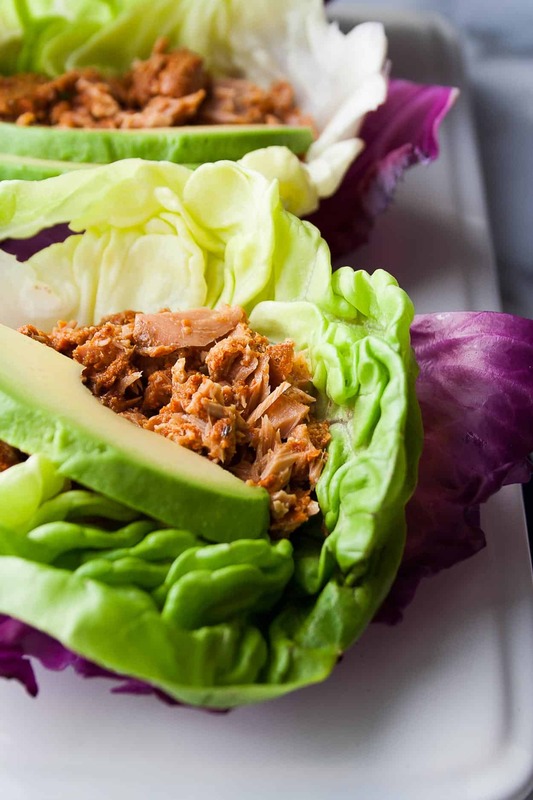 Let’s make some cajun tuna lettuce wraps! I love using butter lettuce for my wraps because of the texture and flavor. But here’s the deal, they are thin and tear really easily. My favorite tip is to use cabbage as your outer shell – this super sturdy purple cabbage works as the ideal vessel for our lettuce wraps. And then comes the best part – Cajun Tuna! 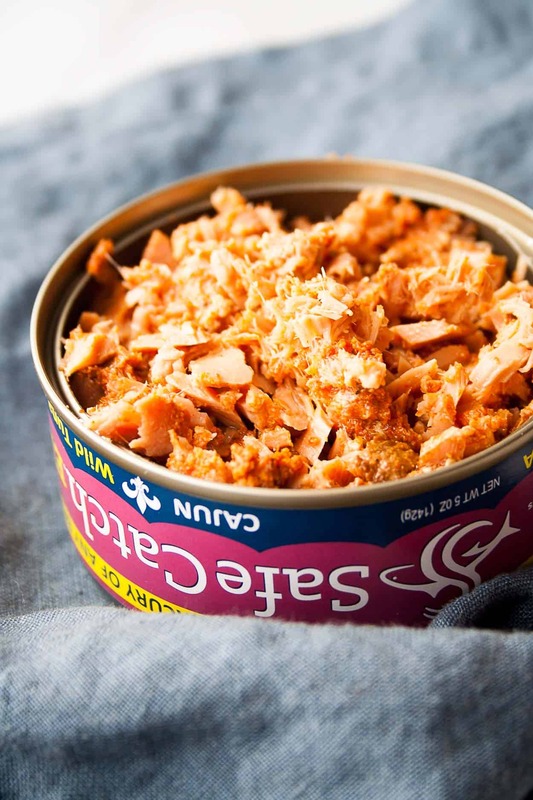 Having pre-seasoned tuna saves me so much time in the kitchen (or let’s be real… at my desk, in front of the computer). This flavor is seasoned with avocado oil, paprika, garlic, cayenne, black pepper, thyme, oregano, and onion! Add a few slices of avocado on top and a spicy dressing and we just made lunch in 5 minutes! When you make these 5-Minute Cajun Tuna Lettuce Wraps post a picture on social media and use the hashtag #imhungrybynature for a chance to be featured! Take each cabbage leaf and remove the thick stem. Cut large leaves in half. Line three pieces of cabbage with butter lettuce. 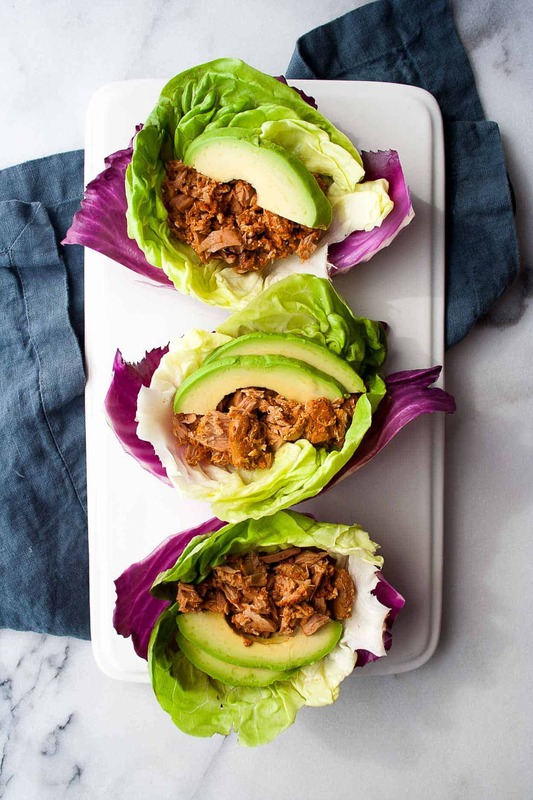 Divide the Safe Catch Cajun seasoned tuna between the three lettuce wraps and top with sliced avocado. In a small bowl, mix together tahini and adobo sauce. Add water to thin to desired consistency. Drizzle on lettuce wraps and enjoy!